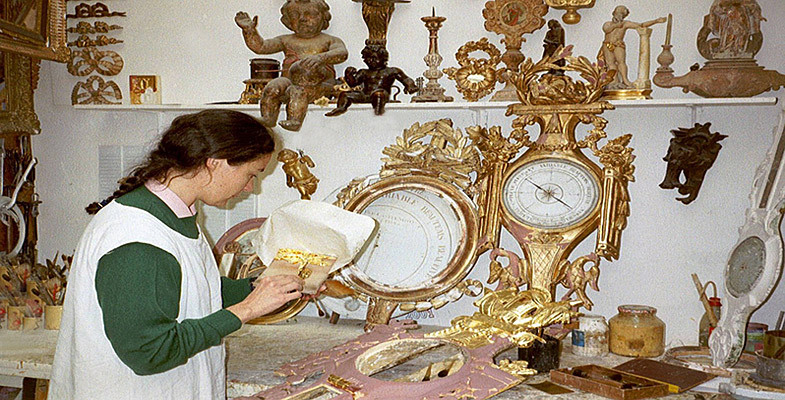 A specialty of the store is mercury barometers, scores of which ornament the walls in their golden frames. The artist meticulously replaces the mechanisms, adjusts Torricelli tubes, regulates the small pulley that animates the needle when the mercury goes up or down depending on the atmospheric pressure. Everything seems so simple when she talks about it. Although they derive from the experiments of Italian physicist, Evangelista Torricelli (1608-1647), who discovered the existence of atmospheric pressure in 1643, mercury barometers still had to await the time of French king Louis XVI (1724-1792) to witness its Golden Age. Its sculptured wooden frame hides an 83-cm glass column filled with mercury, with variations in levels actuating a pulley that moves a needle on a dial inscribed with several captions: “Very Dry”, “Fair”, “Variable”, “Rain” and “Stormy”. Barometers come in various shapes depending on their style. From Louis XIV’s era to the XIXth century, every barometer has its own aesthetic features, but the working mechanism is always identical. At the end of the XIXth century, mercury-based devices were abandoned in favour of aneroid mechanisms activated by a mechanical lever.